I love Astha Narang’s Astha Narang Sangeet Outfits. I never knew Astha Narang had affordable designer outfits for your wedding and pre-wedding needs. But from the way her collection looks, she is a one stop shop for all your lehenga and anarkali demands. From sequins, to gota she has everything and some of her outfits are stunning to look at. If you have caught the designer bug, and wish to purchase a one of a kind designer lehenga without burning a hole in your pocket, then read on. I have already written a post on Astha Narang Best Reception Lehengas. In this post, we will focus on Astha Narang Sangeet Outfits. I posted about affordable designer labels the other week, back then Astha Narang was on my shortlist, but when I actually sat to see all the designs worthy of a mention…it was almost one post long ! I just couldn’t fit it in the same post. So that was the idea behind writing this one on Astha Narang Sangeet Outfits. There are so many options for sangeet outfits in colors, styles and designs….its going to be one tough decision to pick favorites, I assure you. Featuring a beige net flared lehenga with red floral thread embroidered all over it. It is paired with red tie-back blouse with thread embroidered sleeves and red net dupatta with thread applique work on it. I have been to lehenga stores where the staff has told me under 30k lehengas are a rare sight even for Sangeet purpose. Then can you imagine getting a legit designer lehenga under 30k !! Beige is not really my preferred color, but the bold red is making all the right noise in this outfit. A super versatile outfit option, one that is highly reusable in others wedding function as well. This lehenga set features a black front open cotton satin blouse with sheer embroidered thread work sleeves. It comes along with peach silk lehenga with sequins embroidery and black border. It is paired with sequins embellished peach net dupatta. One of the prettiest Astha Narang Sangeet Outfits from the collection, I am in love with the embroidered sleeves. The black color stands out boldly with the peach background. Its the perfect sangeet night outfit. Featuring a carmine pink net kalidaar lehenga with thread embroidery on it. This lehenga has sequins embroidered border all around the hem. It is paired with matching thread embroidered net blouse with keyhole detailing and button at back. Additionally it also comes along with carmine pink sequins embellished net dupatta. Ok, so I guess red is my ultimate favorite from the Astha Narang collection. No matter what the style, design from sequins to embroidery or gota…I am in love with this color. There is something about it…its like blood red and even her plain lehenga skirts are making the right bridal statement. This piece is again at a steal deal. Special mention to the detailing on the blouse. Absolutely stunning. This lehenga set features a red net blouse with sequins and dabka embroidery. It comes along with matching crepe lehenga with thread and sequins embroidery. It is paired with sequin embellished red net dupatta. I love this about Astha Narang – having multiple options in the same color, same price. If you don’t like the blouse pattern in one…there are other options with the same color combination. Easy for us to pick our choice, right? Featuring a cream net blouse embellished with sequins and nakshi hand embroidery. It comes along with cream gold block printed sequins embellished silk lehenga and cream net gold border dupatta. This outfit works on so many levels, be it sister of the bride outfit, mehendi outfit or even a summer sangeet outfit. You can get away with anything if you choose to invest in this lehenga. This set features a yellow lehenga in net base with threadwork floral motifs scattered all over and a broad silk border along the hem. It comes along with a matching yellow thread and sequins embroidered blouse with a deep cut out at the back and a yellow dupatta with scattered sequins along the border. This is the quintessential perfect budget mehendi outfit for you. The color is totally in this season, and if you are having a summer wedding, then you should give this piece a serious consideration. This set features a peach lehenga in silk base embellished with moti work and gold sequins embroidered floral motifs scattered all over and mint green wide border around the hem. It is paired with matching peach sheer blouse in net base with mint green floral embroidery all over with gold sequins embroidered lining. It comes along with peach net dupatta with sequins border. If you are an Anushree Reddy fan, loves peaches and mint…but don’t know where to pick an affordable outfit for your sangeet function…then Astha Narang’s peach embellished lehenga is the right option for you. I love the sheer blouse, I think its the highlight of this entire outfit…and the color shades go perfectly in sync. This set featured a mint green lehenga set in net base with red thread work embroidered rose motifs scattered all over and wide red silk border around the hem. It is paired with matching mint blouse in net with red floral thread work and gold sequins embroidery all over. It has a matching net dupatta with sequins embroidered bootis all over. One of the most re-pinned lehengas on our Pinterest. This mint green lehenga with the red border gives the right amount of oomph to the outfit. If you like mints, but want a bold color to accentuate the outfit too…then this is the right lehenga for you. Its one stunner of a piece and the price is steal worthy. This is my personal favorite in the list. This set features an off white off shoulder short kurta in silk base appliqued with gold gota and sequins floral motifs all over the front, back and sleeves. It comes along with a matching off white lehenga with an underlayer of can-can and a net dupatta with gold flower motifs embroidered along the hem. This outfit is elegance personified. The perfect off-white number. I love the off-shoulder embellished look. Whites are totally in this season, and its nice to see designers giving us multiple options to choose from. This lehenga set features a red net blouse with thread embroidery and sequins work in floral pattern and deep cut out back. It comes along with matching georgette lehenga with thread and sequins embroidery all over. It is paired with sequins embellished red net dupatta. Are you in love with the red just like me. The minute I see this lehenga, I feel like forgetting all about peaches and mint. Who can really stand a chance against this color. Bold and beautiful, this sequins flared lehenga is ideal to make the right bridal statement on your sangeet night. Featuring a peach net kalidaar lehenga embellished with nakshi and sequins hand-embroidery. It is paired with matching blouse with tie-knots tassels at back. It also comes along with peach sequins embroidered dupatta. I would have ideally put this up under reception lehenga if not for the blouse. The blouse is the only bit, which makes me include this for a sangeet lehenga. Otherwise…a net kalidar lehenga in sequins that too which is in peach…this outfit screams wedding lehenga. For all those of you who are not into bold colors, this outfit is just perfect…Have you seen its price tag? STEAL DEAL ! Where to buy Astha Narang Lehengas? What do you think of her collection? 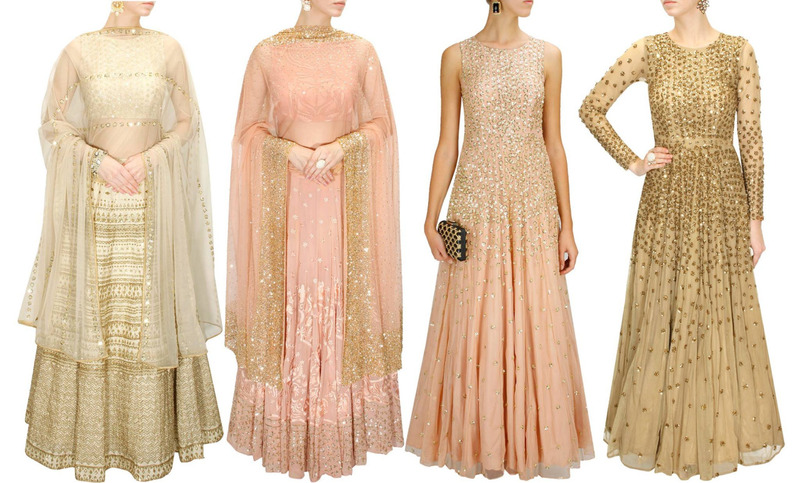 Which lehenga was your favorite from her collection?